Back in 2017 I started a series on my blog called 'In Conversation With' where I interviewed and talked to a wide variety of disabled people and those connected with disability, I've spent many years sharing my own experience of disability on my blog but that is just one experience and I wanted to widen my readers understanding of disability by talking to a range of different people. It's been quite a while since I last posted an interview but I'm hoping that the series will make a comeback this year, starting off with an interview that I've been meaning to post for far too long! 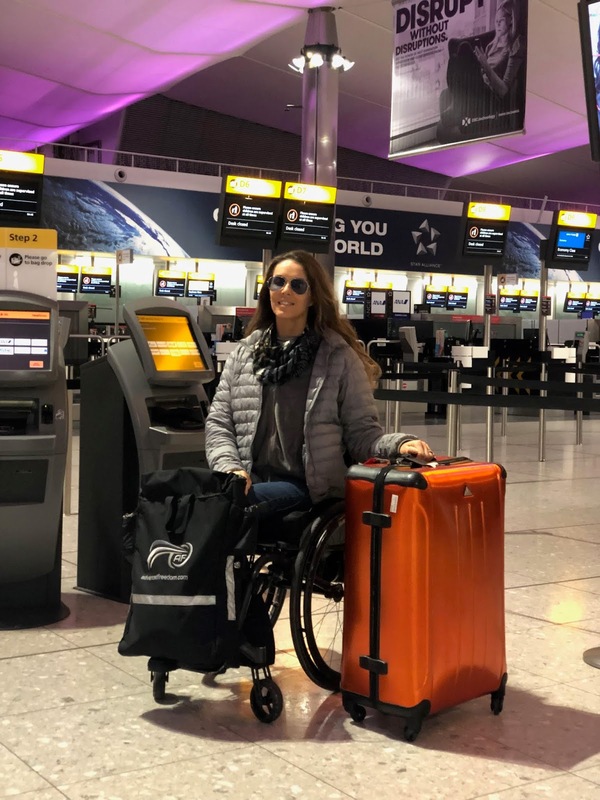 I came across Louise Sertsis through her business, Advanced Freedom, last year when I was looking into bags that would work for me as a powerchair user, after having not much luck with anything from the mainstream market. 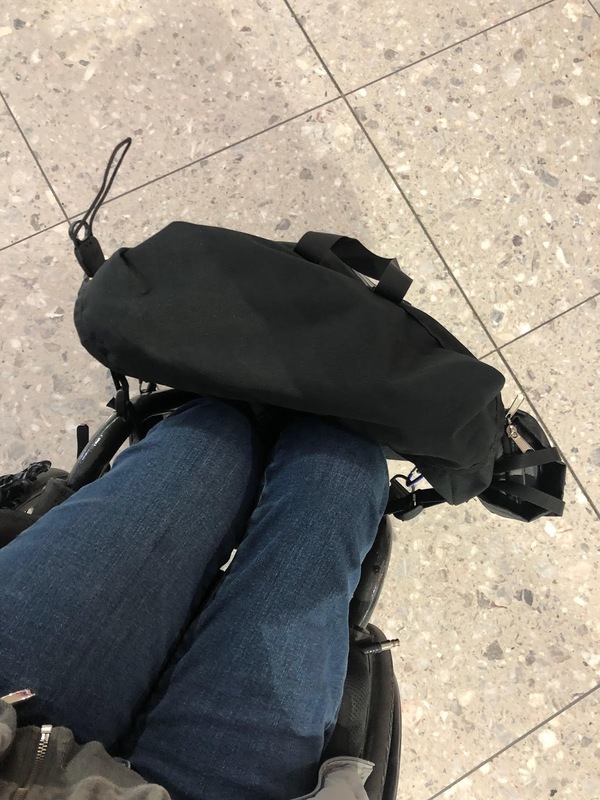 I wanted to be able to travel from A to B with a bag without needing assistance from someone else and so I was delighted to hear about the bag that Louise had designed, The Handi Pac, a bag specifically designed for wheelchair users to give them freedom and independence when travelling. It's a bag that attaches to you, not your wheelchair, and sits on your legs rather than on the back of your chair allowing for easy access. Sometimes you come across things that you just want to shout about and this was one of those things! I talked to Louise about the bag, it's importance and the future for herself and other disabled people looking to start up their own business. 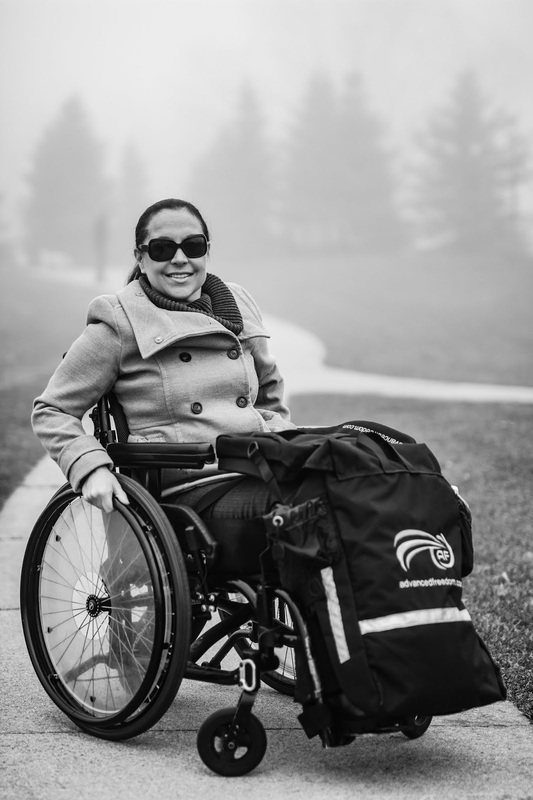 The Handi Pac is like nothing else on the market currently, Louise told me about what sets it apart from other bags. Similar to a backpack for the able-bodied individual, but made especially for the seated person. The only bag that fastens directly onto the person, alleviating the need to retrieve items at the side or the back of the individual. Disabled people often do not have the capacity or the strength to turn around, let alone the ability to raise their arms while performing a specific task. Runs the length of your lower leg, with magnetic closures that fastens the bag around your calf area. All zippers/buckles on traditional bags are replaced by magnets. It's the largest wheelchair bag on the market; accommodates an array of items when shopping, going to school, or travelling the globe. Top portion of the bag is attached by magnets to the lower portion of the bag. This part of the bag allows for easy access to smaller items such as a phone, sunglasses, purse, wallet, sunscreen, magazines, calculator, notebooks, tablets, and more. Lap portion of the bag has a quick release seatbelt that fastens to the mid-thigh area and allows for easy removal, and is adjustable to the user. I think this is a struggle a lot of wheelchair users share, I want to be independent but there are only so many bags I can hang off my powerchair meaning I either limit the amount of food shopping I do, for example, or I take someone with me to help. Many of us result to adapting how we do things, or adapting products already on the market so I asked Louise how she would like to see various industries change to adapt and cater better for disabled people. I would love to see more disabled people following the path that Louise has gone down, taking matters into their own hands and designing products that work for themselves and other disabled people but it's no easy process, I spoke to Louise about challenges and barriers she's faced. 'This journey is very exciting but at times overwhelming. It is very gratifying to see your idea come to life whilst helping others, I'm a sole proprietor and I'm learning as I go. I was very lucky to find a mentor, someone who truly believes in my product and especially in me. I'm beyond grateful for all his help, or else I probably wouldn't have gotten to this point. My recommendation would be to form relationships with like minded people who share the same vision as you. By building a team of people, things move a lot quicker and cause less stress. I think that if there were more disabled people creating products for the disabled market then I believe there would be a greater spotlight on disability as a whole. As they say 'necessity is the mother of invention' and unless you're in need of something it's difficult to create something completely new. That's half the creative process, if it's something you need then chances are many other disabled people would benefit as well. I was lucky enough to try The Handi Pac out recently and was really impressed by how high quality it was, as well as it being far easier to use than I imagined! The magnetic closures are simple and don't require too much strength to undo and the bag sits comfortably. Unfortunately for me it doesn't fit into my lifestyle, I would have trouble getting on the bus with it but I did speak to model, Samanta Bullock, who has found the bag to be very useful in her life. The Handi Pac Kickstarter will go live towards the end of January/beginning of February, follow Louise and myself to keep up to date with when it's available.